When a 10 year-old girl in Haryana, India can see that her community is in need of more male heroes to protect the safety, livelihood, and rights of women and girls, something must be done. 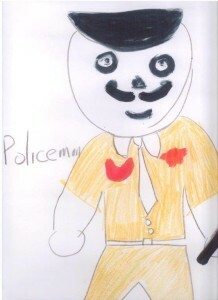 One of the most poignant submissions came from a ten-year-old girl, who submitted her version of the new male hero – a policeman who is committed to protecting the women in his community even when that means standing up to his superiors. If a young girl understands that policemen need to be the catalysts for change, it is time for her vision to be brought to life.